The use of radiant barriers in homes and buildings as a way to reduce utility costs is not a new concept. In fact, the history of the use of radiant barrier and reflective foil insulation technologies dates back to as early as the 1920's when radiant barrier was used to insulate residential and commercial buildings. In the 1950's, INFRA Insulation was introduced to the consumer market as an accordion-fold style product and was touted as easily installed by anyone who could use a staple gun. Newspaper advertisements even depicted women installing the radiant barrier in their own homes. By the early 1960's, millions of square feet of radiant barrier has been installed in homes and buildings. Unfortunately, an unfavorable FTC ruling against Infra Insulation Inc., coupled with the untimely death of Schwartz in the early 1960's, resulted in the INFRA Insulation radiant barrier product being taken off the market entirely by 1965 and the business being closed. In the mid 1950s, when Clark E. Beck, PE, of Wright-Patterson Air Force Base engineered the development of radiant barrier technology for NASA and the space program, he couldn't have envisioned the variety of applications for which this insulation material would someday be used. 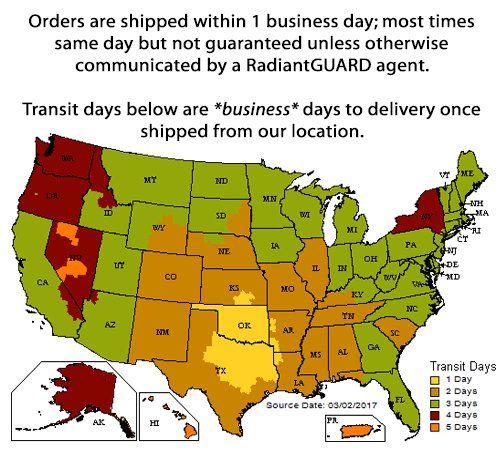 Radiant barrier has been in use by NASA since the Gemini and Apollo missions. The insulation was the prime element of the environment control system that allowed Apollo astronauts to work inside the Command Module in shirt sleeves, rather than in bulky space suits. Since the Gemini and Apollo missions, the radiant barrier has been used on virtually all spacecraft, including unmanned missions where instruments required thermal protection. With the confidence and support of architects and engineers, word started spreading quickly in the insulation industry of the benefits of radiant barrier products and very well known testing facilities and research organizations conducted their own radiant barriers studies in order to quantify the results builders and the like were claiming as a result of the use of radiant barrier and reflective insulation products. The Department of Energy, Oak Ridge National Laboratory, Florida Solar Energy Center, and Texas A&M University, to name a few, have proven substantial benefits radiant barriers provide. While radiant barriers have been around for longer than most imagined, the road to acceptance and popularity was not an easy one. But with the determination of energy-efficiency focused engineers, architects, builders and the reflective insulation industry itself, scientifically supported benefits of radiant barrier have become widely available and accepted by governmental agencies like ENERGY STAR, builders, and consumers alike as a cost effective way to permanently reduce utility bills and increase the comfort of homes and buildings.